Terror and suffering occurs far too often in the world. I was sickened by the terror attack in Paris, and the global response in solidarity with France has been encouraging. Unfortunately, it is difficult to properly recognize every crisis. The lack of consideration in American media for the atrocities committed by Boko Haram in Africa seems more than inadequate. According to Amnesty International, the terrorist group murdered 17,000 Nigerians and displaced over 1 million others between 2009 and the beginning of June 2015. Boko Haram has allied itself with ISIL in the Middle East and proved resilient to military forces from Nigeria, Niger, Cameroon, and Chad. Unfortunately, few Americans can point out those countries on a map, much less distinguish any details about the massacres and abuses. The Western world must remember that African nations deserve just as much aid and awareness as any other region, and take action to dissolve Boko Haram. Why do we need to learn more about Boko Haram? Their ideology directly contradicts almost every freedom we take for granted as citizens of Western nations. Boko Haram translates to “Western education is forbidden.” According to the BBC, the organization forbids individuals from participating in any ‘Western’ social or political pursuit, including secular education, voting, and Western dress. Just like ISIL, Boko Haram is a radical Islamic state and engages in jihad. In September, The New York Times reported that 1.4 million children have been displaced in Nigeria and its surrounding countries, thanks to Boko Haram’s efforts to target children. Boko Haram’s human violations did reach a mainstream audience in 2014, when the organization abducted 270 schoolgirls. A Twitter hashtag, #BringBackOurGirls, helped their plight reach global awareness — but 16 months later, most of them are still imprisoned and, according to the BBC, many have been forced to fight for their kidnappers. This is the reality for many children in Nigeria. In a United Nations statement, Manuel Fontaine, UNICEF regional director in West and Central Africa, said, “It’s truly alarming to see that children and women continue to be killed, abducted and used to carry bombs.” Despite efforts from the Nigerian government, attacks on children have grown rampant around Boko Haram territory. The formula for consistent reporting on world issues, rather than Western world issues, begins with increasing interest among the general population. The tragedy in Paris is morally reprehensible, and it unfortunately provides only one example of terrorism seen around the world. Simon Allison, a writer for an affiliate of The Guardian, argued, “African lives are still deemed less newsworthy — and, by implication, less valuable — than western lives.” A prime example of this came in the second weekend of January 2015, after the Charlie Hebdo attack. Boko Haram committed a mass murder of 2,000 Nigerians on the same weekend, but the world was so focused on Paris that the Boko Haram storyline merely registered as a blip on the radar. The unfortunate reality is that impoverished people are much more likely to become involved in violence and crime, because of desperation. Terrorists like Boko Haram gain a foothold in regions because the population is oppressed and destitute, and thus easily manipulated. 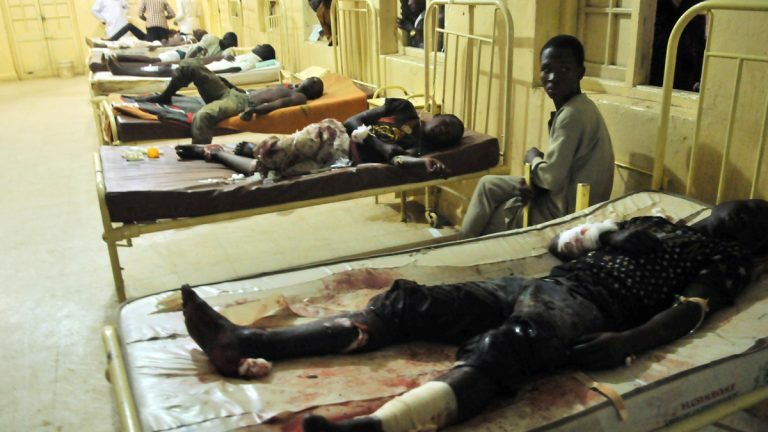 The U.S. government and the global media can provide aid and raise awareness of the atrocities in Nigeria, as well as supporting the Nigerian government in overthrowing Boko Haram and instituting comprehensive human rights to the Nigerian population. Short-term Twitter trends are not enough to create real change. Major advances only occur when enough people condemn the status quo. Syria is but one nation that needs humanitarian and political assistance; Nigeria is facing jihadists who are just as intent to perform human rights violations and murder.